Family Guy is back with it’s 10th DVD of outrageous and irreverent humour. Like the previous DVD releases, this DVD is called ‘Season 10’, but is actually the 2nd half of season 8 and 1st half of season 9 from the original US broadcast seasons. Once again Seth MacFarlane and the rest of the Family Guy crew set out to entertain and offend in equal measure, inducing a mixture of laugh out loud gags, groan inducing puns, and astonishing ‘I can’t believe they got away with that’ statements. A great example of this is the final episode of season 8 ‘Partial Terms of Endearment‘, which deals with Lois trying to get an abortion. The show ended up airing first on BBC3 due to it being banned on US tv on the original run because of the subject matter (although it has since aired). Also included is ‘And Then There Were Fewer‘, the 2 part ‘whodunit’ opener from season 9, where the group are invited by actor James Woods to his stately mansion on a remote island, and the brilliant hour long 150th episode starting everyone’s favourite sarcastic dog and psychotic toddler, ‘Brian & Stewie‘, locked in a bank vault overnight and forced to examine their relationship in detail. There’s the usual plethora of guest voices too, ranging from Hugh Laurie, to Charlie Sheen, to Patrick Stewart and Drew Barrymore. Overall, really what more can I say other than it’s Family Guy, as good as ever. If you love the show, the Family Guy Season 10 DVD is well worth getting! DVD Extras include the usual bunch of commentaries on various episodes (including one for the controversial ‘Partial Terms of Endearment’), animatics, deleted scenes and an entertaining half hour from the Family Guy panel at Comic-Con 2010. 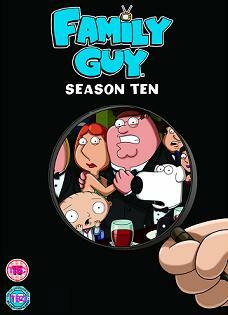 Family Guy Season 10 DVD is released on the 9th May 2011 in the UK. Buy Buy Family Guy Season 10 DVD from Amazon here or rent Family Guy and other tv shows here from LoveFilm. 8/10 – More Family Guy – as outrageous and funny as ever! ← Happy Star Wars Day: Best of YouTube! Family Guy has become one of my favorite shows, I love the witty humor about politics, religion, and celebrities. I was able to catch up on the most recent episodes on DISH Network’s new website. They have thousands of shows and movies available and you can access it from any computer. I actually have and work at DISH and you can check it out for yourself at http://bit.ly/dJzWgo.